Although Peter Ditchfield lived at Barkham Rectory, he had strong links with Arborfield, Newland and Barkham C.E. School, and took part in many events in Arborfield. During the Great War, he and Rev. Joshua Anderson both had a lot to do with the welfare of the soldiers at the Remount Depot. During the 1920's, Peter Ditchfield wrote the 'Notes and 'Queries' local history page in the 'Reading Mercury'. He helped to complete the Victoria County History of Berkshire in several volumes, helped in Volume 3 (which covered Arborfield) by J. Hautenville Cope, whose family had been linked with Bramshill House, just across the Hampshire border, since the 1600's. He gave a guided tour of the ruins of the old Arborfield Church, and his hand-written notes are held at Reading local Studies Library, and can be seen here. Not only in Berkshire, but throughout the country, deep regret will be felt that the Rev. Peter Hampson Ditchfield, F. S. A., for 44 years Rector of Barkham, and a man of distinguished literary gifts, president of the Berkshire Archaeological Society, passed away on Tuesday. He had been seriously ill for some weeks. Mr. Ditchfield's death is a great loss to Berkshire and the country as a whole. Mr, Ditchfield was a Lancashire man. The eldest son of Mr. Peter Ditchfield, of Westhoughton, he was born at Westhoughton on April 20th, 1854, and was educated at the Royal Grammar School, Clitheroe, and later at Oriel College, Oxford. In 1878, he was ordained, becoming a priest in the following year. His first appointment was to a curacy at Sandhurst, where he remained until 1880, when he went to Christ Church, Reading. Mr. Ditchfield held a curacy there for six years, and in 1886, was appointed Rector of Barkham, which office he had held since. Mrs. Ditchfield, to whom he was married in 1898, is a Berkshire lady, being a daughter of the late Mr. Charles H. Smith, of Ravenswood, Wokingham. Mr. Ditchfield's scholastic attainments were notable. He held the following degrees and distinctions: B. A. (1877), M. A. (1881), F. S. A. (1882), French History Society (1894), F. R. S. L. (1900), Hon. A.R.I.B.A. (1920), and 2nd Class Math. Mod. (1873). 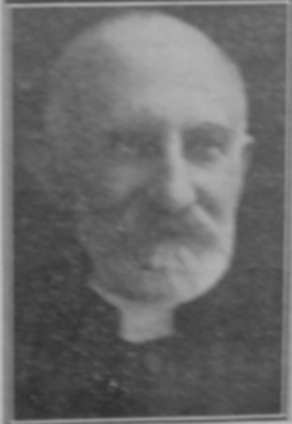 He was organising secretary of the Society for the Propagation of the Gospel for Berks from 1890 to 1907, and from 1886 to 1903 he was Diocesan Inspector of Schools. Mr. Ditchfield enjoyed the distinction of being one of the Parliamentary Electors of the Universities. He was prominently connected with the Friends of the University of Reading, and one of his last visits to Reading was on the occasion of the conferment of degrees at the University this summer. This year he also occupied the position of president of the Old Clitheronians' Association, an organisation connected with his old school in Lancashire. In addition, he was editor of the "Victoria County History of Berks", and general editor of the "Memorials of County History Series". Mr. Ditchfield had been associated with the Masonic craft for a great many years, and had held high office. He was Grand Chaplain of the Freemasons of England in 1917 and of Mark Masons in 1918. He was a member of the Berkshire and the Authors’ Clubs. "He has enriched English Literature by upwards of 100 volumes, apart from his many valuable and interesting contributions to periodical publications, volumes and articles both having been chiefly on history, archaeology, topography, architecture, village and old country life and on London, although two would figure in catalogues under the head of ‘Fiction’. His first publishers were Methuen and Co. – Sir Algernon Methuen was a college friend – indeed, Methuen’s first published book, in 1883, was one written by Bro. Ditchfield, who has ever since published, though not exclusively, through that firm. He is responsible for the interesting weekly column on archaeology which appears in the ‘Reading Mercury’. He has lectured in several parts of England on ‘Shakespeare’s England’, ‘Old Village Life’; on ‘Fairs’, etc., at Reading, Bath, Warwick, Cambridge, Stafford, etc., while he has also found time for travel in France, Italy, Germany, Netherlands, but particularly in his own country, of which he knows all parts, practically every nook and corner. "It is really superfluous to tender to readers of the ‘Masonic News’ the information that Bro. Ditchfield has taken a keen interest in the craft of which he has been a distinguished member even from his initiation in 1893 in the Downshire Lodge, 2437, at Wokingham, of which he was Master in 1901; he was one of the founders of the Heather Lodge, 3131, Wellington College, of which he was Master in 1913 and is now chaplain; also of the Berkshire Masters Lodge, 3684, of which he was Master in 1923, and of the Authors’ Lodge, 3456, his only Masonic tie outside Berkshire. He is an honorary member of the Berries Lodge, 2928; of the Victoria Lodge, 2671; and of the Ex Libria Lodge, 3765. He was [unreadable] honorary member of the Windsor Castle Lodge, 549; he was appointed P.P.G.W. of Berks and Oxon in 1906 and Grand Chaplain of England in 1918. He was perfected in the Albert Victor Rose Croix Chapter, 117, Reading, in 1923; joined the Grafton Chapter, 128, of which he is P.M.W.S., and, in 1927, was admitted to the 30th Degree. He has lectured on the History of Masonry to the Berkshire Masters, the Essex Masters, Fratres Calami Lodges, and has contributed articles to the ‘Transactions of the Authors’ Lodge’, the ‘Masonic Secretaries’ Journal’, etc. "Combined with his great, unparalleled store of learning, Bro. Ditchfield has a charming personality and suavity of manner, always anxious to perform any act of kindness possible, that has endeared him not only to his own parishioners, but to his much wider circle of Masonic friends". His work as secretary of the Berkshire Archaeological Society was invaluable. For 38 years he held this post, and on the death of Mr. C. E. Keyser last year he was elected president of the society. He was editor of the "Berks, Bucks and Oxon Archaeological Journal" for 33 years up to the time of his death. He was the author of "Reading Pageant" [the Pageant was held in 1920, and there was a long series of weekly articles on the Pageant], and collaborated with Dr. J. F. Read, who was organist at Christ Church during Mr. Ditchfield’s curacy there, in many notable musical productions. On New Year’s Day, 1928, the parishioners of Berkshire presented to their beloved rector an illuminated address to mark his completion of 50 years in the Ministry, 42 of which had been spent at Barkham. The address stated: "To more than our generation of parishioners you have been both pastor and friend, your literary and archaeological achievements made your name known far beyond Barkham, and your writings have, in a rapidly changing age, done much to –people the past and save them from oblivion the memories of bygone days". Mr. G. Harris, the people’s warden, who presided at the presentation ceremony, said that just as the neighbouring village of Eversley had become famous from its association with the Rev. Charles Kingsley, so, he ventured to prophesy, Barkham would become famous for its association with the Rev. P. H. Ditchfield, and many people come to the village through having read his works. During Mr. Ditchfield’s incumbency at Barkham the old barrel organ was replaced by a more modern instrument, a new chancel was built, the church re-roofed, and a village hall built [this was on Barkham Street and was demolished in the 1980’s]. Mr. Ditchfield never allowed himself much time for physical recreation, and his pastimes have been recorded in "Who’s Who" as "arranging meetings, correcting proofs and inspecting schools". He has played cricket, however, with the Gentlemen of Berkshire, Wokingham and other clubs, and he was fond of riding, appearing in the hunting field occasionally many years ago. The caption was: "STRIKING TRIBUTE TO A DISTINGUISHED FIGURE in Berkshire was paid on Saturday at the funeral at Barkham of the Rev. P. H. Ditchfield. Above: A section of the large attendance. 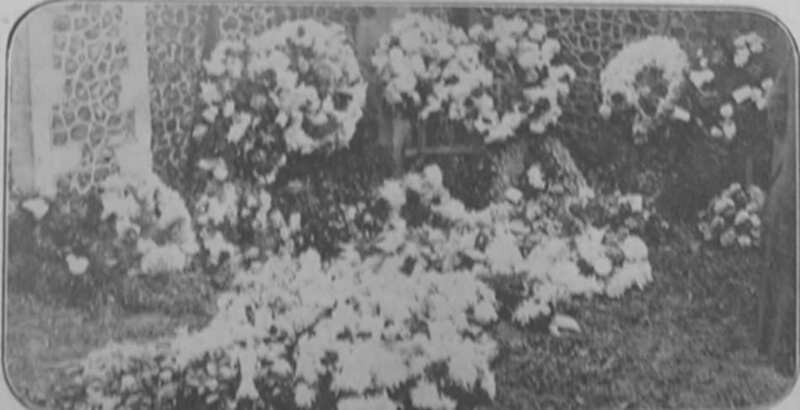 Below: A few of the many lovely floral tributes."